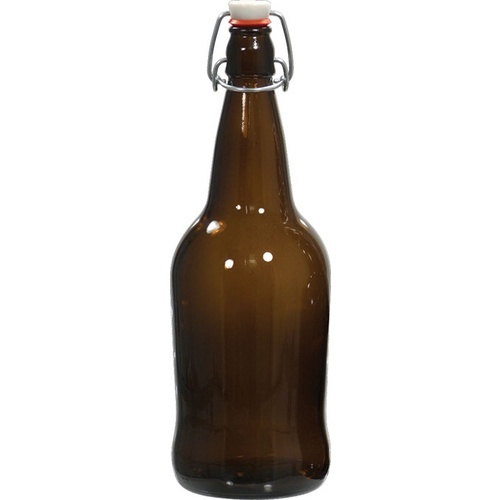 Case of 12 x 32 oz Amber EZ Cap Bottles and 12 Swing Tops. Crown Caps not included (see recommended items below for options). These are great and never fail to make a great beer. Also I have went through 2 bottle capers and it worth the money spent for these 32 oz bottles. I like the design of this lid, rather than screw caps. Best for bottling home brew, this is my second case, loved the first! Needed them as I'm making beer for my daughter's wedding. Bottling beer in 12 ounce increments is such a pain - this price + shipping was unbeatable vs. the competition and the size was right! Looking forward to receiving the bottles! Like the larger bottles and EZ swing caps. Are the tops plastic or ceramic? BEST ANSWER: E.Z. Caps are currently manufactured using a strong molded plastic cap with a rubber gasket. The white part of the top is plastic. Will a hand capper (wing type) work on this bottle? BEST ANSWER: I just tried to use my hand capper with these bottles and the neck of the bottle was too thick for the capper to close all the way and seal the cap. The capper I have is the one from the morebeer starter kit. Derek, what capper did you get? If you did, what do you recommend ? My starter kit came with the Brev metal capper. It works fine on bottles and bombers. I keg my beers and bottle a couple using these flip top bottles. They work great. No, You just use your hands and flip the top down with your hands. or flip it up to open. These are great for brewing. Will use in all future bottling. Absolutely love these bottles they are thick and heavy hold just enough for 3 full 10,5 oz beers. I have 6 cases of these and 5 cases of the 16 oz easy to reseal bottle so you can finish it later. I purchased a case of bottles. Relatively easy to clean and the cap stays well sealed. I’m very impressed with their quality, capacity, and ease of use. They’re just what I needed. I purchased these because I didn't have zoom in my Keezer to keg my chocolate porter. I purchased a case and now get to enjoy via bottles again. These bottles are very easy to clean and very simple to use. Before I started to keg, these were life savers. I spent many years collecting Grolsch bottles and any other flip tops I could find (there are some small soda companies that use them too). I ultimately bought 2 cases of 750ml bottles to speed bottling night and completely remove caps from my normal bottling routine. This is a better deal than I found back then. Instead of spending hours, you can have 5 gallons in sealed bottles in less than 30 minutes. Not quite as easy as kegging, but close.